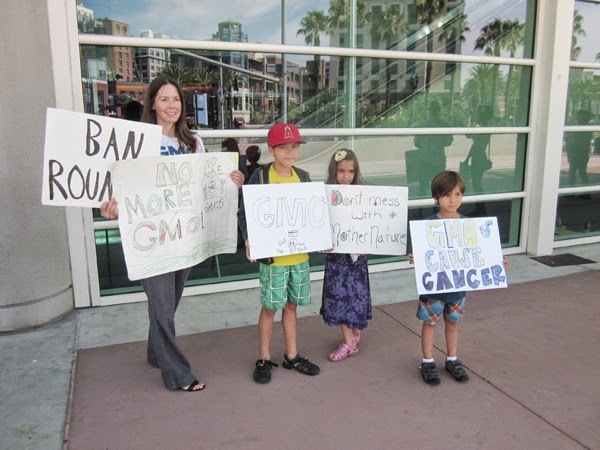 The demonstration against the Biotechnology Industry Organization’s (BIO) 2014 convention in San Diego June 23-26 was small. 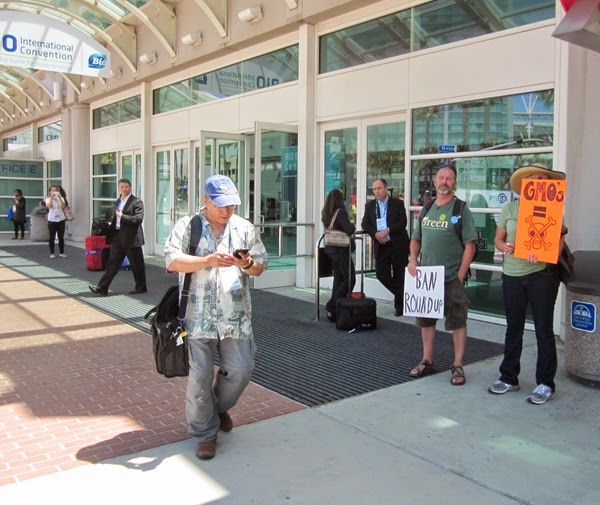 A hastily thrown-together action outside the San Diego Convention Center on BIO’s last day in town, June 26, attracted no more than about 20 people at any one time. But among those people were a delegation of activists from Hawai’i, which has become an unlikely ground zero in the battles over pesticides, genetically engineered crops and the future of farming in the U.S. and worldwide. Led by Nomi Carmona, a Hawai’ian activist and president of Babes Against Biotech (BAB), the Hawai’ians particularly targeted three pesticide companies — Syngenta, Dow Chemical and DuPont Pioneer — for a lawsuit they’ve filed against the county government of Kaua’i, one of the Hawai’ian Islands. 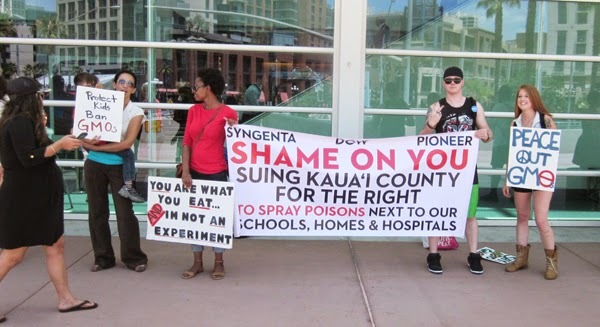 The suit, filed last January in federal court in Honolulu, seeks to throw out a law opponents of pesticides and genetically modified organisms (GMO’s) got through the Kaua’i county government in 2013 limiting the use of pesticides and GMO’s in experimental farms on Kaua’i. In addition to setting up buffer zones between experimental farms and residents, Carmona explained, “That bill also required disclosure of what they’re spraying on us and what genetic traits they’re experimenting with [in creating GMO’s], and to do environmental and health impact studies.” Getting the bill approved by the Kaua’i legislature was itself a tough struggle — Kaua’i Mayor Bernard Carvalho, Jr. vetoed it and the Kaua’i County Counsel passed it over his veto in November 2013 — and with the companies suing to have it invalidated, it’s become even tougher. One thing the companies and the activists agree on is why Hawai’i in general, and Kaua’i in particular, have become ground zero for research in pesticides and the GMO crops designed to withstand them. Because Hawai’i is America’s only tropical state, it has an excellent growing climate and can generate three to four crop cycles per year — compared to only one or two on the U.S. mainland. And because it’s made up of five islands, the test fields for pesticides and GMO’s can be kept relatively isolated and free from cross-contamination with other forms of agriculture. As a result, Syngenta and DuPont Pioneer each leased about 5,000 acres of land on Kaua’i, and Dow subsidiary Agrigenetics leased 3,500 acres. The companies use this land to grow a mix of GMO crops, including corn, soybeans, canola (rapeseed) and rice. The lawsuit states that Kaua’i’s climate gives the companies “the invaluable opportunity to triple or quadruple the pace of development of GMO crops,” which is “crucial” to their success. That’s exactly what Hawai’i’s environmental and anti-GMO activists are trying to stop. In addition to Kaua’i, the government of Mau’i is considering a similar bill and the local government of Hawai’i, the largest of the islands and colloquially called “the Big Island” by locals so it isn’t confused with the entire state, just passed a bill banning the growing of any new GMO crops on their land. Supporters of these ordinances say the companies are using pesticides other nations have banned, and that they’re spraying restricted-use pesticides 10 to 16 times per day, 250 to 300 days per year. 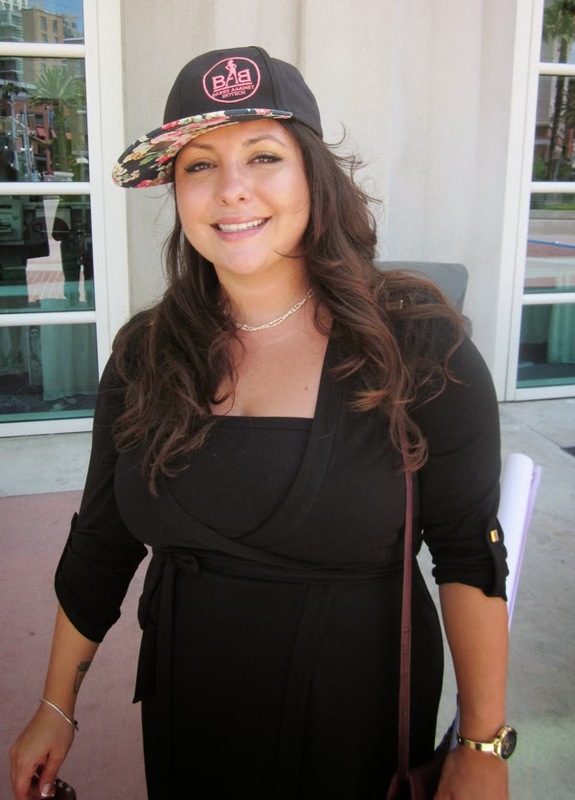 The tale of woe being told by Nomi Carmona has a familiar ring to progressive San Diegans still reeling from the defeat of the Barrio Logan Community Plan at the polls earlier in June. There, too, local activists had sought to set up buffer zones between toxic industries and people’s homes and schools. They won at the San Diego City Council, but industry fought back by putting the community plan up for a public vote by the entire city — and the plan was defeated by a 20-point margin. The campaign against it claimed that passage of the Community Plan would push the Navy out of San Diego, close the shipyards and cost the city 45,000 jobs. Those are the same arguments Carmona hears when she debates the pesticide/GMO issue back home on Kaua’i. “I could give you their entire testimony,” she said. “Every time it’s always the same thing: ‘We provide jobs. We provide a valuable service. Over three trillion GMO meals have been served.’” She also said company spokespeople tell elected officials and ordinary citizens to “ignore all the other peer-reviewed science in the entire world, and just listen to the ‘science’ that they fund,” which says GMO’s are safe. The biotech industry’s take-no-prisoners attitude towards its critics has allowed the food, chemical and pesticide industries to sneak GMO’s into Americans’ food with virtually no public debate. Elsewhere in the world, that hasn’t been the case. France, Germany and almost all other European countries have passed laws requiring that food containing GMO ingredients be labeled as such. “All we want are the kinds of laws your countries already have,” some of the anti-BIO protesters told convention delegates from Europe. But U.S. industry leaders have raised millions of dollars to defeat ballot measures in California and Washington requiring foods containing GMO’s to be labeled. And they’re threatening a lawsuit against the state of Vermont for passing a labeling bill in their state legislature. The relative absence of organized protest to the 2014 BIO convention in San Diego — an event extensively ballyhooed in the local media because Hillary Rodham Clinton came to town to deliver the keynote speech — stood in stark contrast to what happened the first time BIO came to town. In the summer of 2001, opponents of biotechnology in general and GMO’s in particular organized an elaborate response, including hosting their own “Biojustice” convention two days before BIO’s opened and bringing in worldwide speakers, including Vandana Shiva from India and Canadian farmer Percy Schmeiser, whom Monsanto sued for patent infringement — and won — after their genetically modified canola seeds contaminated his crop. Opponents also tried to set up an elaborate series of street actions during the BIO convention itself. Unfortunately, the San Diego police and business establishment were ready for them. Partly to ward off a riot similar to the one in Seattle in November-December 1999 at the World Trade Organization’s ministerial meetings, and partly to show the biotech industry that the city was on their side, the police mounted a massive presence, closing off much of downtown San Diego. Police also aggressively enforced traffic laws — including arresting people for stepping outside crosswalk lines when crossing streets — to lock up as many protesters as possible and discourage those left free. The Centre City Development Corporation (CCDC), the now-defunct redevelopment agency for downtown San Diego, organized meetings of local property owners to make sure nobody rented temporary space to host anti-BIO demonstrations. As a result, the Biojustice organizers had to set up their “convergence center” miles away from the convention, in the parking lot of an alternative church in Golden Hill. The quasi-military tactics of the police put off not only Biojustice protesters but BIO delegates as well. 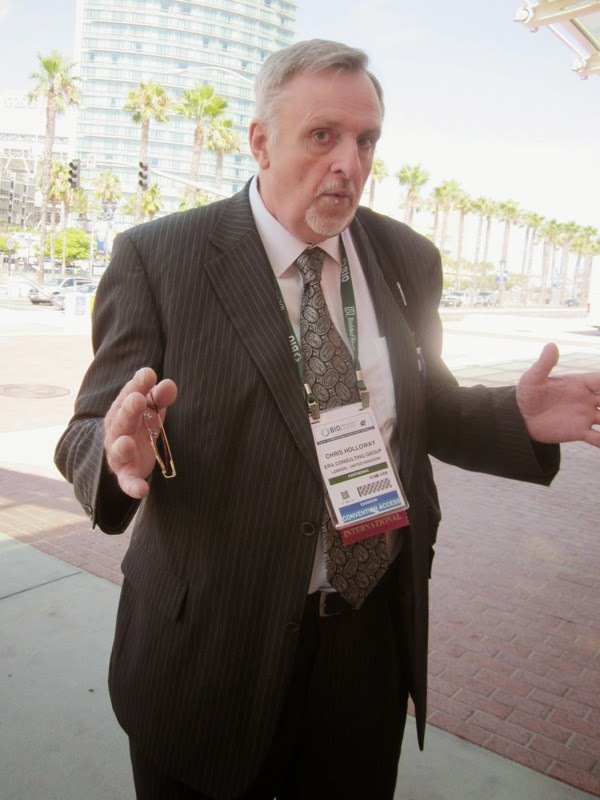 Chris Holloway of the ERA Consulting Group in London attended both the 2001 and 2014 BIO conventions and was astounded that in 2001 he couldn’t get anywhere near the Convention Center without showing his delegate badge. At least one activist who participated in Biojustice suggested that the heavy-handed police response to the 2001 anti-BIO protests discouraged local activists from mounting major challenges to later BIO conventions in San Diego. This may be why activists have paid so little attention to BIO in a city where the three Marches Against Monsanto in May and October 2013 and May 2014 have drawn large crowds. 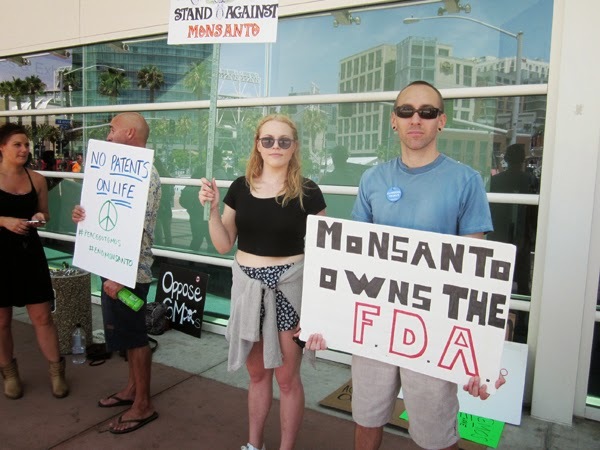 The last March Against Monsanto on May 24 drew over 3,000 people and featured a pre-march rally of local speakers urging anti-GMO activists to support community gardens, farmers’ markets and other alternative ways of obtaining freshly grown, organic and non-GMO food. The relatively tiny size of the anti-BIO demonstration June 26 had one unforeseen result: protesters got to talk to BIO delegates one-on-one and found a number of them surprisingly sympathetic to their cause. Chris Holloway took exception to a sign that said “GMO’s = ” with a drawing of a skull and crossbones. But he told protesters he agreed with their opposition to GMO’s in agriculture. His concern was that medical researchers like himself be allowed to use genetic engineering to develop treatments for hereditary diseases. Holloway told protesters about the elaborate precautions medical GMO researchers take to ensure their GMO’s don’t contaminate the environment, including destroying all waste products excreted by their human research subjects — a far cry from the notoriously sloppy practices of agricultural GMO researchers. 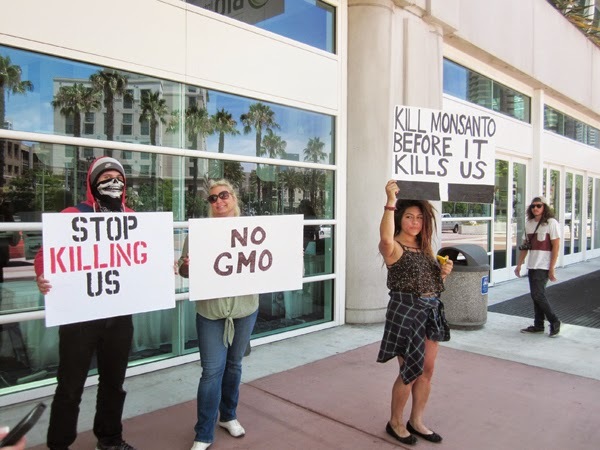 In general, BIO delegates from other countries — including most of western Europe, where GMO’s are either banned outright or there are labeling requirements for foods containing them — were more sympathetic to the protesters’ cause than Americans. Hendrik Jan Houthoff, a delegate from LINXIS in Amsterdam, drew the same distinction as Holloway between medical and agricultural biotech research. “The way Monsanto does it doesn’t help mankind,” Houthoff said. He added that his daughter, who does biological agricultural work in France, is even more anti-Monsanto than he is. Asked why his daughter doesn’t like Monsanto, Houthoff said, “Because they are using methods of agriculture that kill diversity in nature, that kill insects, and that don’t help farmers because they have to buy [seeds] from Monsanto every year.” Some of the demonstrators were astonished to hear a BIO convention delegate essentially repeating their talking points and attributing them to his own daughter. Nomi Carmona did get into an argument with an African-American graduate student in biotech who conceded that “it is a legitimate concern when you’re talking about how people get food when it’s not grown in their area.” But the grad student basically took the industry’s point of view that GMO’s should be assumed to be safe and the burden of proof should be on those who want them banned to prove that they aren’t. “If you’re going to make an argument, there have to be a lot of facts with it,” she said. — A Huffington Post article, http://www.huffingtonpost.com/2012/10/26/prop-37-opponents_n_2023719.html, published October 26, 2012, revealed that food and chemical companies had contributed nearly $30 million to defeat Proposition 37, which would have required labeling of foods containing GMO’s in California. This doesn’t count what was spent in the last week before the election, which could have brought the total closer to the $46 million Carmona claimed.